2019 Third Party Logistics Study - Infosys Consulting - One hub. Many perspectives. The 23rd Annual Third-Party Logistics (3PL) Study examines the global outsourced marketplace and leading trends for shippers and 3PLs in the logistics industry. The last mile in the world of logistics has quickly become one of the most mission-critical areas for shippers to address, as issues that occur here have major impact on brand perception, reputation and customer satisfaction. A mix of enhanced data along with emerging technologies, such as artificial intelligence, can play a key role in meeting the ever-increasing demands of today’s enterprise customers. 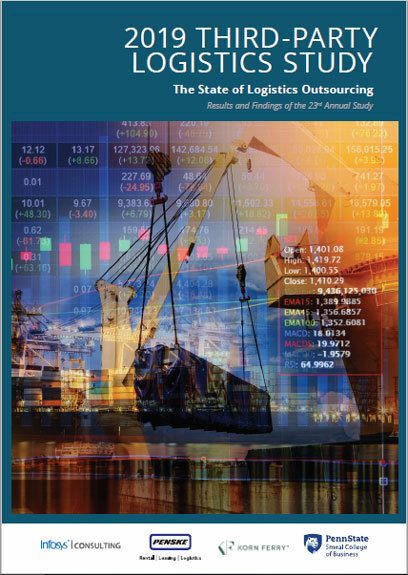 The 2019 Annual Third Party Logistics Study continues the tradition of exploring trends in shippers’ use of outsourced logistics services and tracking the dynamics of 3PL-shipper relationships.